The Bomber Girls are supporting the troops fighting for world freedom in Europe and the Pacific. Click here to play! Every one of them performs a vital role in keeping the boys abroad fighting fit and in high spirits. The war effort requires all citizens to give their utmost, and the Bomber Girls don't intend to lose the war on the homefront. There's Lucy, a blonde bombshell dressed in red. She tours as an entertainer, ensuring the morale of the troops with her skimpy costumes and dance routines. Amy Blascowicz, a brunette in a white tank top, does her best to help recruit more soldiers. Germaine is another blondie girl fighting the good fight, working intelligence in the air force in her form-fitting khaki uniform. She's joined by Jenny in communications, who loves to strut around in a bomber jacket to keep the lads warm. In a more direct support role, Nurse Patricia tends to our wounded heroes and Drusilla works as a mechanic in our armored divisions. All six of these women are dedicated to winning the war, performing to the best of their abilities every day. With their heads held high, these brave girls perform important duties vital to the assurance of an Allied victory. Join the Bomber Girls now in their efforts to turn back the tide of fascism before it can sweep the globe! Compass symbols are scatter symbols. They trigger a free spin bonus when three appear on reels 2, 3 and 4. The sum of the first two symbols equals the number of spins, up to 14. The number of the last symbol is the multiplier for those spins, up to a massive 3 times! 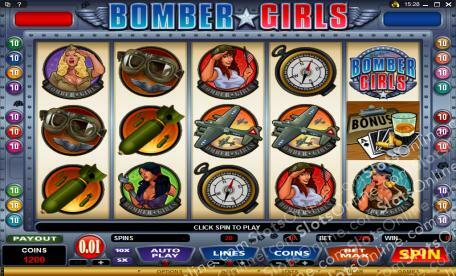 The Bomber Girls Logo symbol can substitute for any of the individual bomber girls. The Poker Bonus symbol on reels 1 and 5 triggers the bonus game. In it, you can first multiply the total bet by playing a guessing game. 5 cards are dealt, with the first face up. You must then guess in sequence whether the next card will be higher or lower in value. If you successfully guess for all of them, then a second game involving two cards is offered. You may bet all of your win, half of your win, or none of it. If you successfully choose whether the second card is higher or lower than the first one, you win twice your stake.